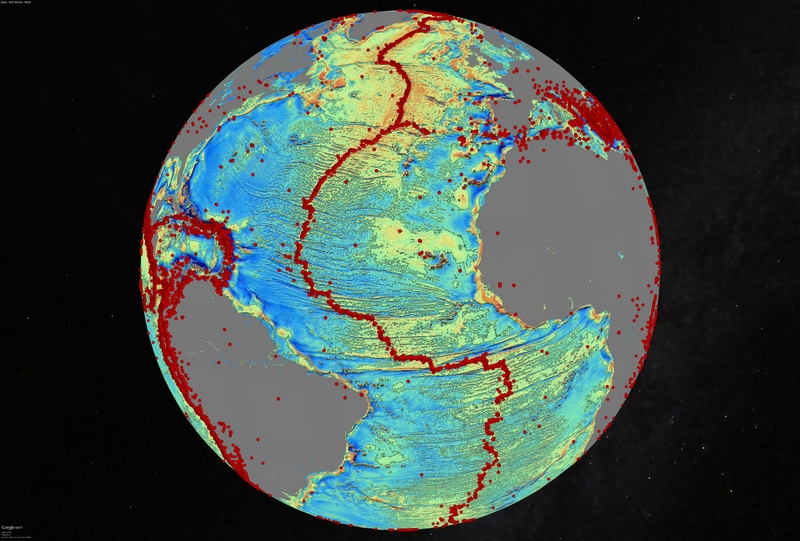 Data on slight variations of the pull of gravity over the oceans are recorded with satellite altimetry, and are then combined to map the seafloor globally. 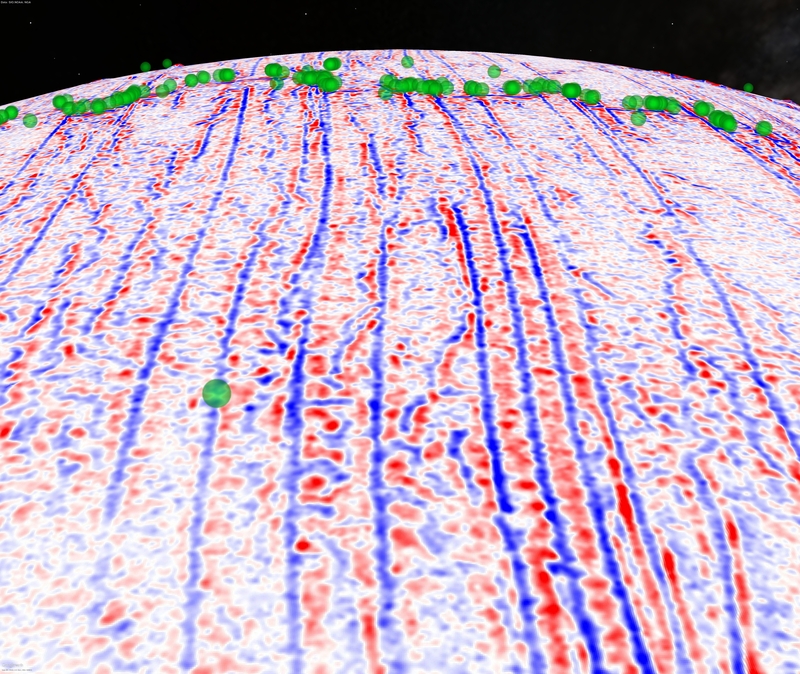 Sandwell, D. T., R. D. Müller, W. H. F. Smith, E. Garcia, R. Francis, New global marine gravity model from CryoSat-2 and Jason-1 reveals buried tectonic structure, Science, Vol. 346, no. 6205, pp. 65-67, doi: 10.1126/science.1258213, 2014. Author information and acknowledgments. We thank Debi Kilb and Alan Yang at IGPP for their help in producing this video. 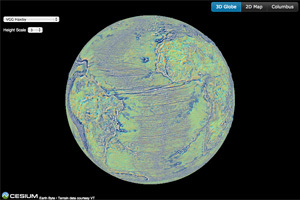 Download Google Earth software for viewing KML overlays on a globe. These grid files may be read using GMT software. Here is an example on how to plot these grids. These cloud-based tools are provided courtesy of Dietmar Müller on the GPlates Web Portal and require a WebGL-enabled browser. 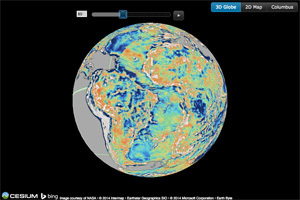 For more information on these visualizations, please visit the EarthByte page. Marine gravity model of the North Atlantic (10 mGal contours). 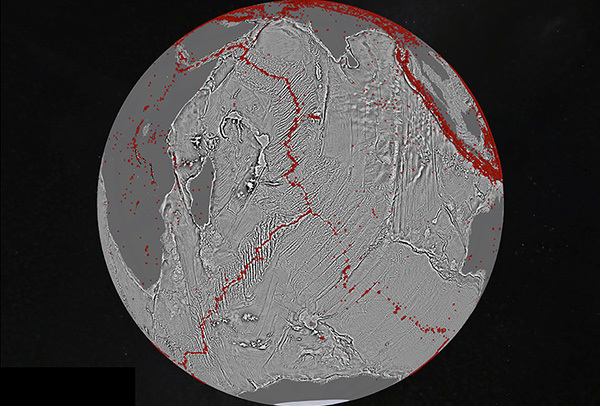 Red dots show locations of earthquakes with magnitude > 5.5 and they highlight the present-day location of the seafloor spreading ridges and transform faults. 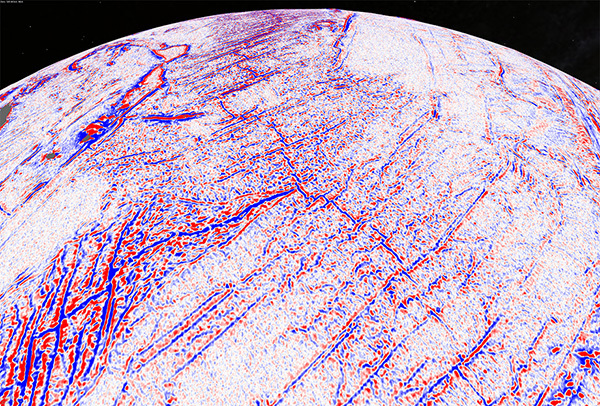 This gravity information shows the details of the plate tectonic history of the rifting of these continents including the subtle signatures of fracture zones that are currently buried by sediment. 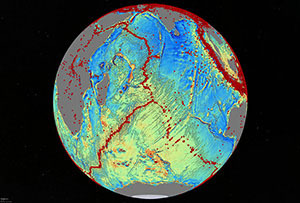 Marine gravity model of the Central Indian Ocean (10 mGal contours). Red dots show locations of earthquakes with magnitude > 5.5 and they highlight the present-day location of the seafloor spreading ridges and transform faults. The image is centered at the Indian Ocean Triple Junction where three major tectonic plates meet (African plate – left; Indo-Australian plate – right; Antarctic plate bottom. This region of the Indian Ocean is very poorly charted and includes the search area for the Malaysian flight MH370 that was lost March 8, 2014. Vertical gravity gradient (VGG) model of the Indian Ocean Triple Junction. The image is centered at the Indian Ocean Triple Junction where three major tectonic plates meet (African plate – left; Indo-Australian plate – right; Antarctic plate bottom. 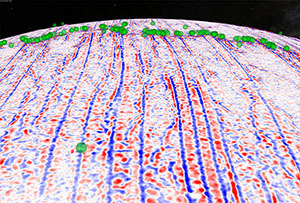 Vertical gravity gradient (VGG) model of the Southwest Indian Ridge. 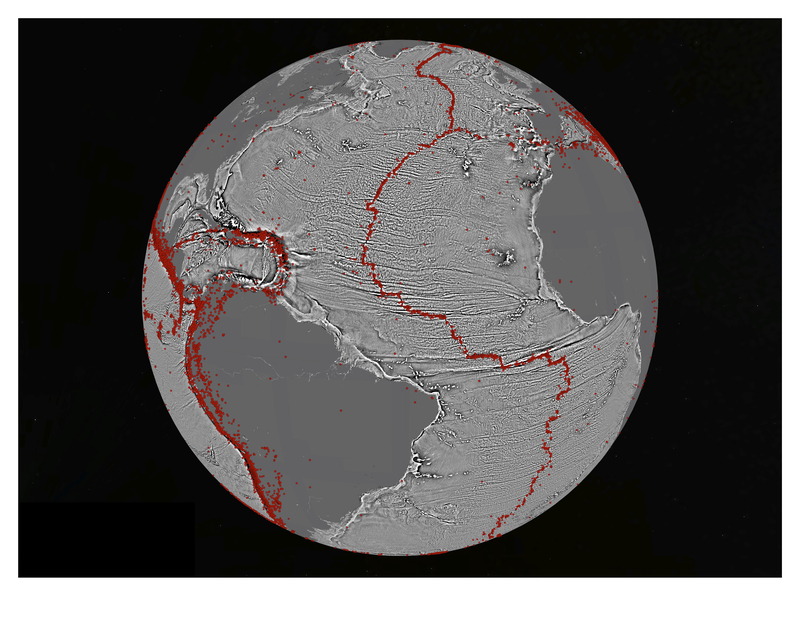 This is the slowest spreading ridge on the Earth and has large fracture zone signatures that record the rifting and spreading between Africa and Antarctica. Vertical gravity gradient (VGG) model of the southern mid-Atlantic Ridge. 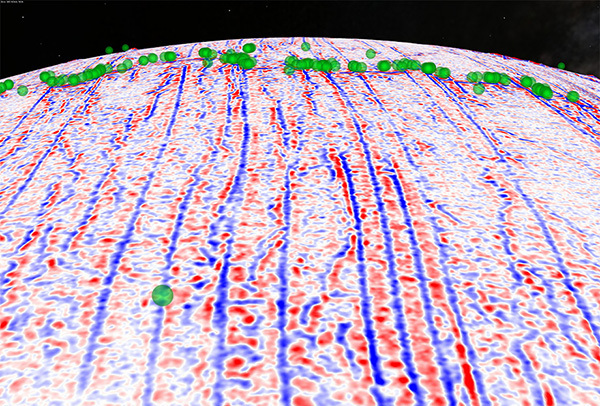 Earthquakes with magnitude > 5.5 are shown as green dots and highlight the current location of the spreading ridges and transform faults. 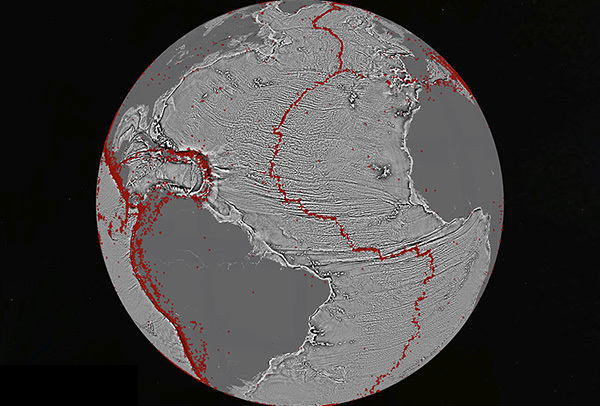 The large fracture zone signatures record the rifting and spreading between South America and Africa. In January 2014, an international team of researchers on a voyage aboard the R/V Roger Revelle in the Indian Ocean mapped a previously uncharted seamount using high-resolution sonar. 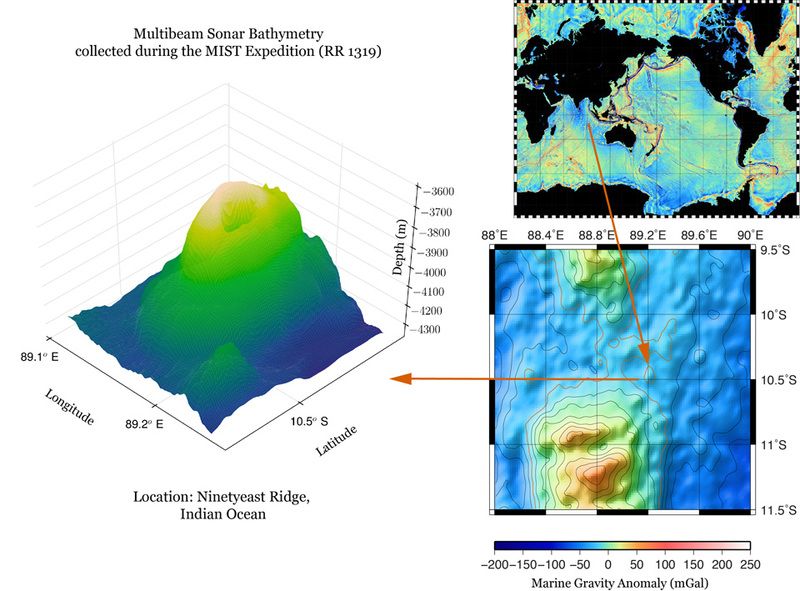 The scientific expedition had just finished collecting sediment cores from the seafloor at the Ninetyeast Ridge in the Indian Ocean when the ship track on the way back to port was adjusted slightly based on the potential location of the seamount as indicated by marine gravity. The high-resolution multibeam sonar bathymetry data show that the newly charted seamount is not very prominent and rises just over 600 m from its base. However, it is wide enough to be detected in the gravity signal. The MIST Expedition (cruise id: RR1319) was led by graduate students from Scripps Institution of Oceanography joined by participants from the Earth Observatory of Singapore. It was made possible by the University of California Ship Funds program. The figure above was generated using a combination of GMT, Matplotlib, and a color palette courtesy of Matteo Niccoli. 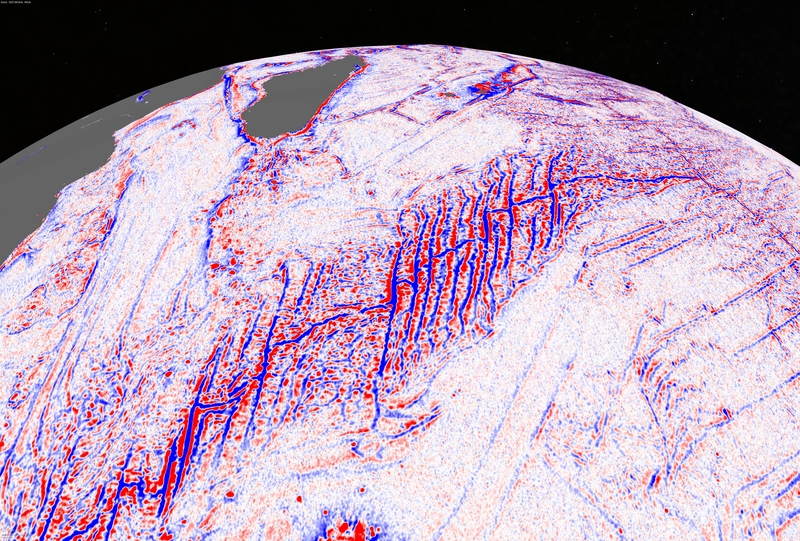 Science perspective article: C. Hwang, and E. T. Y. Chang, Seafloor secrets revealed, Science, Vol. 346, no. 6205, pp. 32-33, doi: 10.1126/science.1260459, 2014. 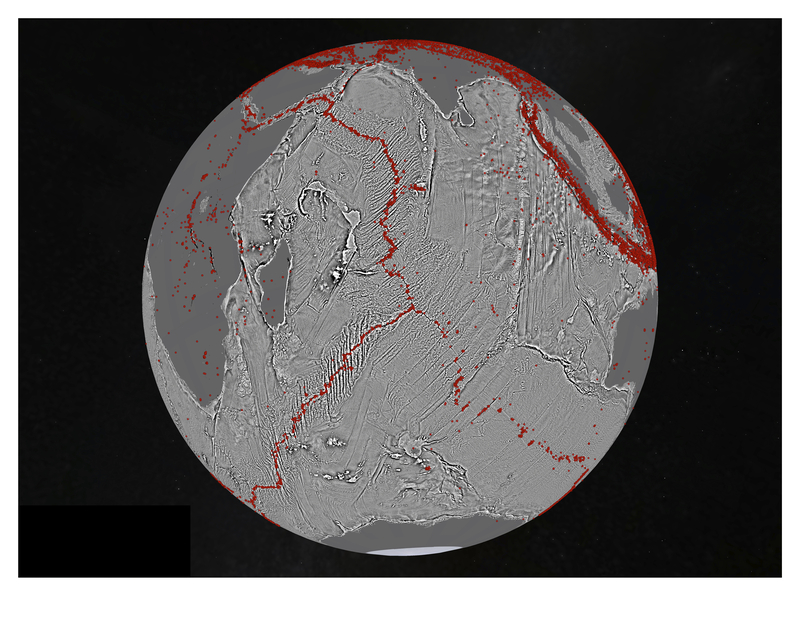 Sandwell, D. T., E. Garcia, K. Soofi, P. Wessel, and W. H. F. Smith, Towards 1 mGal Global Marine Gravity from CryoSat-2, Envisat, and Jason-1, The Leading Edge, 32(8), 892899. doi: 10.1190/tle32080892.1, 2013. Sandwell, D. T., and W. H. F. Smith, Global marine gravity from retracked Geosat and ERS-1 altimetry: Ridge Segmentation versus spreading rate, J. Geophys. Res., 114, B01411, doi: 10.1029/2008JB006008, 2009. The satellite altimetry data from CryoSat-2 is being provided by ESA, while data from the Jason-1 mission was provided by the National Aeronautics and Space Administration (NASA) and the Centre national d'études spatiales (CNES). We also incorporated data from the following missions: Envisat (ESA), ERS-1/2 (ESA), and Geosat (US Navy). This work was supported by the National Science Foundation (NSF), the Office of Naval Research (ONR), the National Geospatial-Intelligence Agency (NGA), and ConocoPhillips. For issues related to this page (broken links and such), you may reach Soli Garcia by e-mail (esg006@ucsd.edu) or Twitter (@heyearth). 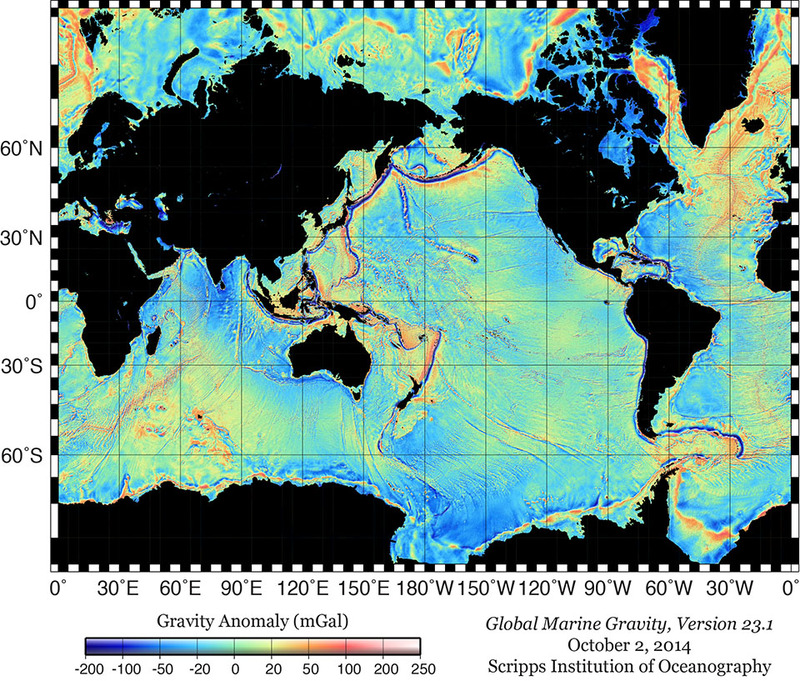 For technical issues related to the marine gravity grids, contact David Sandwell (dsandwell@ucsd.edu). View a compilation of articles discussing our paper on Storify. 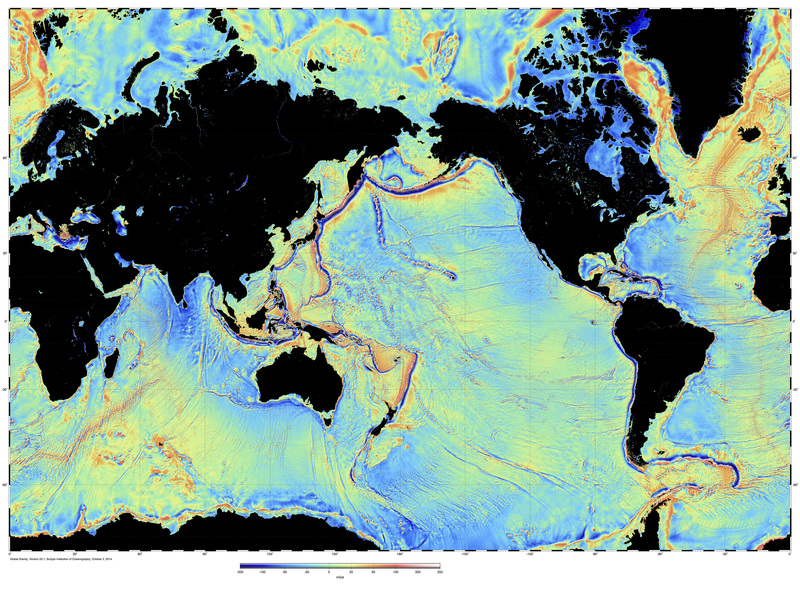 Last updated: March 30, 2015, Institute of Geophysics and Planetary Physics, Scripps Institution of Oceanography, Univ. of California, San Diego.